Policy Rate (OPR) unchanged at 0.5 percent. According to the latest International Monetary Fund World Economic Outlook, the performance of the world economy continues to strengthen. The Financial Intelligence Unit (FIU) would like to warn and advise business entities who engage in purchasing goods and services from overseas suppliers to exercise extreme caution when dealing with their overseas business transactions and payment instructions. 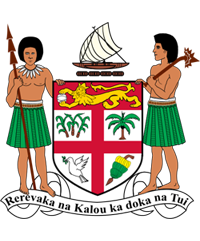 The Reserve Bank of Fiji (RBF) transferred $39.9 million to the Fijian Government today. 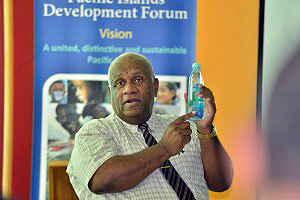 Twenty-three Pacific Island countries and more than ten foreign countries will be participating at the inaugural Pacific Islands Development Forum (PIDF) at the Sheraton Fiji Resort in Denarau from 5-7 August, 2013. The call for a PIDF was endorsed by Pacific Island leaders at the 2012 ‘Engaging With the Pacific’ meeting held in Nadi in August last year. Speaking at a media briefing for the PIDF this morning, the Ministry of Foreign Affairs deputy secretary, Penijamini Lomaloma said PIDF is a unique platform bringing together leaders from the public and private sectors and civil society to address regional development challenges, through mutually beneficial innovative partnerships. “This is the first time we are giving the people of the Pacific a platform to come and express the things that are important to them and participate in the decision making process. This is giving them the ability and the chance to participate at the strategic level of decision making,” Mr Lomaloma said. Mr Lomaloma said projects would also be discussed at the meeting to assist people at the grassroots level. He stressed that the meeting would ensure that decisions made are translated into concrete actions. “The world came together in the meeting in Rio last year and we reviewed where we were in terms of sustainable development. One thing that came out of that meeting is the agreement that the current way of doing things is not working and there is a heavy emphasis on economic growth. Economic growth, while it’s good, the result is what we have today. It is an uneven sided triangle where we just focus on getting economic development at the expanse of the environment and our citizens. The result of that is an increase in poverty, climate change has increased and the financial crisis of a few years ago is all linked to the way we do business. During the Rio meeting, we woke up to the fact that we ought to change direction,” Mr Lomaloma highlighted. Pacific Islands Private Sector Organisation (PIPSO) chief executive officer, Ms Mereia Volavola welcomed the chance given to players in the private sector to discuss issues of sustainable development with the public sector and the civil society. “Added to this forum are the regional and international agencies that provide technical expertise and advice. The inclusion of private sector and CSO and other regional organisations really puts into practice the inclusiveness and the collaboration that had been mentioned in many forums but sadly never followed through. This forum is paving a way of connecting the policy makers and the implementers,” Ms Volavola added. Yesterday [Monday June 10], Attorney-General and Minister Responsible for Elections Aiyaz Sayed-Khaiyum convened and chaired the inaugural meeting of an international committee to discuss assistance for Fijian Elections Office leading up to the 2014 parliamentary elections. “This first meeting marks a significant step forward in Fiji’s preparations for the 2014 elections. The Bainimarama Government’s top priority is making sure that elections are conducted in a smooth, transparent and apolitical manner, using best international practices, unlike elections in the past. Partnership with the international community will help us achieve this,” said the Minister, speaking after the meeting. The coordinating Committee will be responsible for organising and coordinating member countries assistance for the 2014 elections. Yesterday’s meeting included High Commissioners, Ambassadors and representatives from United States of America, Australia, New Zealand, Indonesia, Korea, Japan, India, France and Britain, as well as representatives from the European Union, the United Nations Development Programme (UNDP), and the Commonwealth Secretariat. It is also understood that other countries and organisations may join the Committee. “The Committee has been organised to identify what resources each country is willing and able to contribute,” said the Minister. Committee members are expected to report back to the Minister Responsible for Elections on what specific assistance their governments or organizations will be willing to provide to the Fijian Elections Office in preparation for the 2014 elections. The Coordinating Committee will have its second meeting early next month. All Fiji Citizens living in Japan are now being advised that the Voter Registration Exercise for the 2014 Fiji General Election will be undertaken soon. The Embassy of the Republic of Fiji in Tokyo will be coordinating this exercise and as such we need to ascertain the number of eligible Fiji nationals that are going to be in Japan during the General Election which is scheduled to be undertaken in September, 2014. The voting age for the upcoming General Election has come down to 18 and those that fall in this category should advise the Embassy of the Republic of Fiji, Tokyo of your addresses and contacts so that we can further communicate with you in due course. Please note that the urgency of this exercise is such that the Embassy of the Republic of Fiji, Tokyo would like to receive your contact information (Full name, Date of Birth, Address, Telephone, Email) no later than the 25th of January, 2013. For more information, you can contact Second Secretary, Ms. Kelera Wright on telephone: 03-3587-2038 or email: rakavosa@fijiembassy.jp. Your cooperation will be highly appreciated. 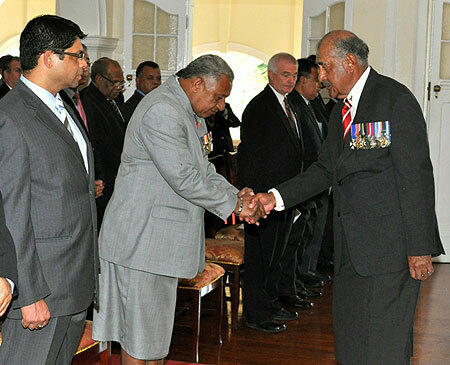 His Excellency, the President of Republic of Fiji, Ratu Epeli Nailatikau was on Monday morning, 12 November 2012 re-appointed for another three years at a swearing-in ceremony at Government House. 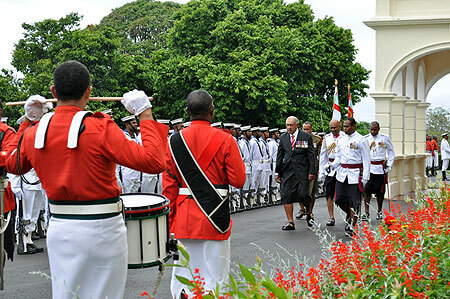 The ceremony was attended by Prime Minister Commodore Voreqe Bainimarama, alongside Cabinet ministers, dignitaries and the diplomatic corp.
Ratu Epeli was sworn-in by Chief Justice Anthony Gates, who administered the Oath of allegiance and the Oath for the Due Execution of the Office of the President. His Excellency following his reappointment ceremony inspected a full military guard of honor.